We developed a game, as part of an effort to encourage people to start thinking about the importance of water in their daily lives, that can be used at home, in the classroom or to get attendees of a meeting engaged. The game is appropriate for all age groups and has two playing options, card trivia game or board game. 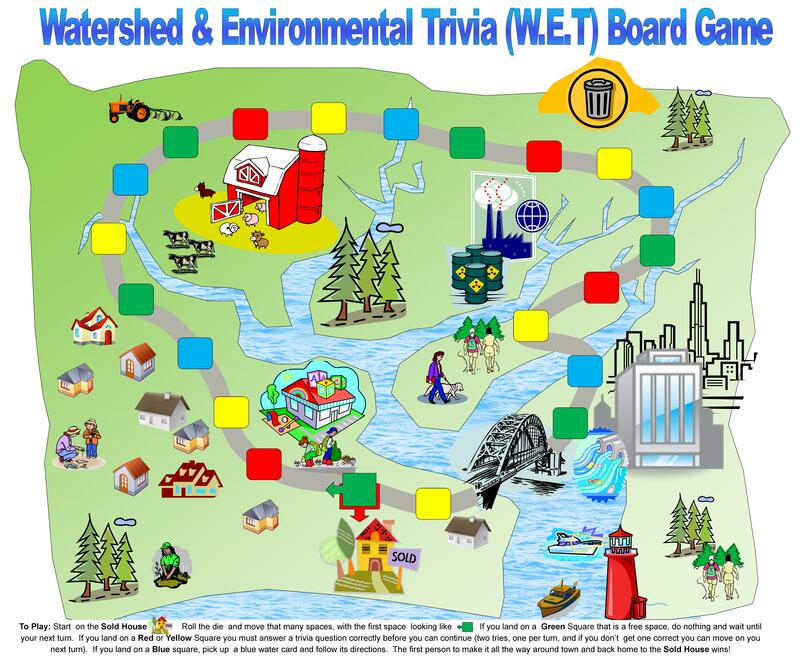 A simple template was developed so that anyone can use it, or you can make your own board and cards that relate to your watershed area. As the economy recovers, development of new residential communities is increasing. To encourage the adoption of landscaping with benefits to water quality in these communities, we have designed and installed a demonstration rain garden and native plant garden in the 2014 Home-A-Rama home tour site in Westfield, Indiana. We built several modules of a booth display to catch kids’ attention and get parents (captive audience) in close so we can provide them with information about the Watershed Management Plan and cost share program. Many communities in Indiana rely on septic systems for their wastewater treatment needs. Understanding septic system function and maintenance is important to their long term performance. There are numerous resources on septic system design, installation, maintenance, etc , which may be overwhelming for some people. This project provides a packet of information that can be used to raise awareness and understanding of septic systems in Indiana. The goal is that watershed groups and other interested parties can adapt and tailor these materials for targeted audiences in their local area – decision-makers (elected officials, commissions, boards), potential homebuyers, homeowner’s associations, individual homeowners, etc. For demonstration purposes, the materials for the final project are tailored to Owen County, Indiana. We are incorporating information from IWLA into summer curriculum for science teachers – grades 5 through 8. We developed a pamphlet/handout breaking down a rain garden into a more manageable slice that the average homeowner can tackle by themselves. We broke down the plants (made the choices easier), and the soil preparations, showing these items in a manageable 4 foot by 4 foot section that can be added by the homeowner as they have the time and resources. We created a tri-fold pamphlet and an electronic template whose primary use is to educate homeowners on the best practices for property and shoreline management as it pertains to maintaining a healthy residential lake environment. The focus is on residential lake areas of northern Indiana. We created social media pages in LinkedIn and Facebook for use in networking, sharing information, posting various watershed related media, and allowing for open dialogue for the public and professionals. Clean Water is a Hoosier Value. What Does Water Testing Tell Us? This is a multi-media communication tool involving the production of a tri-fold pamphlet, a printed magnet, and access to complementary and/or more detailed information on water testing through the lake association web site. The primary intent is to educate lake residents and lake leadership on the common methods to test lake water and to determine overall lake health. The secondary intent is to recruit citizen-scientists to assist in lake management, and to entice lake residents to use the web site more often as a source of information on current lake management practices and projects. Our project focused on the process and results of a survey sent to landowners that previously participated in our cost share programs. The team focused on crafting a clear message for the lay audience about the USEPA Waters of the United States rulemaking process now underway. The team created a video about this technical and often-confusing topic that will be shared on social media and websites to encourage people to submit comments during the comment period.